The announcement of a celebrity’s death is one that hits people in different ways. Unless it’s from old age, the reactions can range from surprise to shock to sadness to cynicism. Although a part of me feels sad or surprised when I hear of the death of a famous individual, rarely will I audibly gasp. Yesterday I audibly gasped when I saw the headline for Robin William’s death. This won’t be a long post going into details of the man’s life. If you’re reading this, chances are you already know about his life and the contributions he’s made to the world. No my friends, this is just a friendly reminder to live life to the fullest. To use your talent and skill to make this world a better place. It was obvious Robin had demons in his life that he was dealing with. We all do. But what I loved about him was that there was never, and I mean absolutely never a time when I saw Robin Williams (either in an interview or on screen) and within minutes I wasn’t laughing. Even yesterday watching an old Charlie Rose interview, I (and Charlie) were cracking up. He infused life with laughter and profundity. One of my favorite movies is Peter Weir’s “Dead Poets Society”. And one of my favorite scenes from that movie is actually the voice over that Apple used earlier this year as part of their iPad “What Verse Will You Contribute” campaign. It’s a scene that inspires you like few other in cinema. It’s a scene that reminds us the most important aspect of life isn’t WHAT, but WHY? You contributed a masterful verse Robin. You brought laughter to a world that so desperately needs it. You found light even in areas where the darkness was thick as stew. Our prayers and thoughts go out to your family. You will be sorely missed. 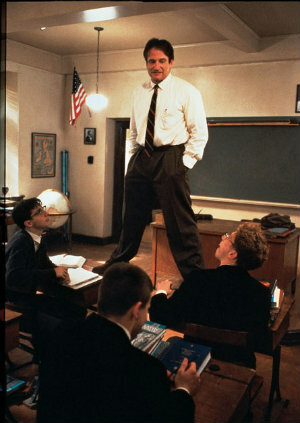 *In the movie, the students refer to Robin’s character as “O’ Captain My Captain”, referencing a poem by Walt Witman. I have never actually read that poem…until today. In light of yesterday’s news, the words of that poem are eerily apropos. P.S. If you or someone you know is suffering from depression, take it seriously. Seek help. Be mindful of any medications you take or are prescribed to take. And listen to your gut.